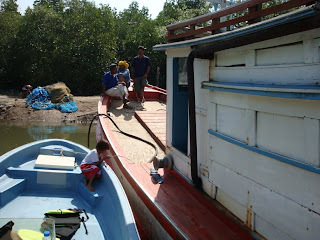 Thai Trawler Conversion: First inspection. After looking at a couple of boats in Phuket town I started asking around with people who had contacts in other areas to help find a suitable boat. A boat maintenance guy in the marina called Wat told me he knew of a boat for sale at Koh Yao Yai. He showed me some pictures on a mobile phone and described a fishing boat that was in running order. Sounded worth a look so we set up a time on a Saturday afternoon to go accross with my Panga to have a look. I am certainly no expert in wooden boats and had never owned a real wood boat before - I have had a couple of ply epoxy cats but they are very different - so was winging it a little and going on gut instinct as I had not intentions of getting a surveyor out to look at the boat or hauling it out to inspect the bottom. 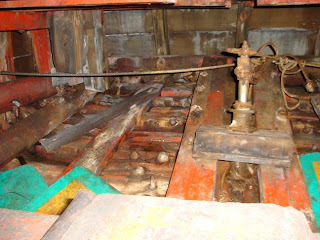 The foredeck was completely rotten but it would need to be removed anyway in order to create a cabin in the front. A lot of knees were cracked and the seams were seeping water all over the place. The engine looked pretty rough - a marinised truck engine with dry exhaust and a truck gearbox complete with foot operated clutch and a big gearbox of the front of the engine driving a set of winches out the side of the wheelhouse for pulling ropes. Again I planned to pull it out and throw away so did not spend much time on it apart from checking it ran and the gearbox functioned. I swam under the boat stabbing it with a screw driver and did not find any soft areas. 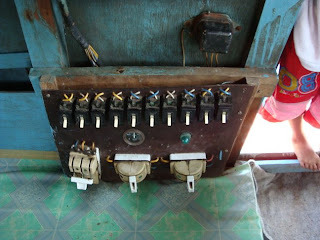 The electrics functioned and there was a depth sounder and a GPS that also functioned. I did not ask for a test drive as the boat was two miles up a narrow winding tidal creek. Time to go home and think about it for a while. 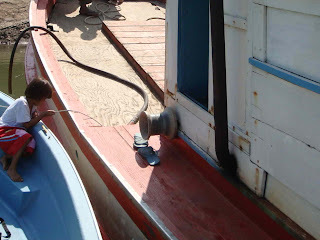 The seller also had to arrange to register the boat properly if there was any chance of a deal - he agreed to do this. Here are some pictures from the first inspection. As bought - original condition.